A lot of rehash of what we have already read regarding the Animal Planet North Carolina Expedition. There are a few choice quotes, the article introduces the four primary researchers of the TV show as actors. At the Tuesday night meeting four actors were introduced. These guys are affiliated with the Bigfoot Field Research Organization. Matthew Moneymaker is the head of the group. Others included an educator, a logger and a scientist who was also the skeptic of the group and often asked specific questions related to the experience. After each story this group of four quizzed the individuals about their experience, drawing out more details. Then finishes up with some, hopefully fruitful, evidence found. The searchers, found a deer carcass, animal hair on a fence and a Bigfoot print in the ground. Montgomery County folks have been shaking their heads in disbelief the past week as believers and curiosity seekers have come together to hear about and hunt for Bigfoot. Television crews from Animal Planet were here to film a segment for the new series, “Looking for Bigfoot.” Previously the crews had been filming in Alaska and were headed to Georgia and Florida next for filming of the six part series. About 200 people filled Troy Fire Department last Tuesday night as film crews came to tape individuals who had had a Bigfoot encounter. Approximately 6-7 people told their individual stories including Daniel Dunn. Dunn told of his winter morning encounter saying he had gone prospecting for gold off Tower Road and carried his gun in case he saw any deer. Dunn eventually shot a spike, but did not immediately go after the deer, since he still planned to look for gold. When he returned to where the deer was, it was gone. Dunn said he had watched the deer for an hour and it had not moved so he was sure it was dead. Dunn begin to search and found a trail where it was obvious something had been druagged. Following the trail Dunn soon saw something standing over the deer. Moving in for a better look, Dunn said he was shocked to see the creature hovering over the deer, stand up. Describing the creature as extremely tall, with huge footprints, Dunn said the creature appeared to be covering the deer with leaves before he dropped to all fours and ran off. Mike Greene of Salisbury got the group going while waiting on the Animal Planet people, who were very late. Greene told of capturing his thermal imagery of Bigfoot in the Uwharries two years ago. 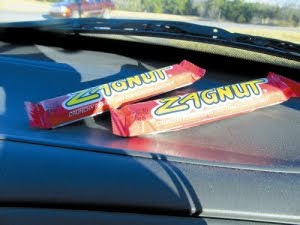 Greene said he had left a Zagnut candy bar on a stump and during the night Bigfoot came and took the candy bar, allowing the camera to catch the image. A recreation of the image is posted on his Website Bushloper.net. Greene also shared some observations about Bigfoot including that they are usually sighted crossing the road and that the juveniles are more active, not as cautious as the adults. Greene also said the creatures were very smart and knew where to draw the line when interacting with people. Greene assured the people they would not be made fun of and their stories would be treated with respect. A lady named Amanda shared her tale of four wheeling in the Uwharries one night with some other people when they stopped at the top on the mountain. Thinking they had jumped a deer, they sat and waited, listening to the noises. Amanda described seeing a creature that was furry and walking on all fours. Saying that it scared her she said she turned into her husband’s back and screamed for him to get out of there. Amanda said she looked back one more time as they were fleeing and saw the creature again. Amanda said it was not a bear and that she was terrified. The incident happened almost 12 years ago and there was a full moon that night. Amanda said they did make a report to the ranger, but all he did was ask them how much they had been drinking that night. Others told of having rocks thrown at them while hiking and even at their campsites. A man from Gibsonville brought photos of paw prints he had photographed near his house. The investigators said it was probably Bigfoot judging by the size of the print and the spacing between prints meant he was probably running. Others had tales of unexplained happenings. Cliff Atkins told of when he was a young boy living off Beaman Road, walking home one night around 11 p.m. Atkins said there were no other houses around then and he had walked that way many times before. That particular night though he heard something behind him, and when he stopped, whatever was behind him stopped. Atkins said this happened several times while he was on his way home and though he was not too scared (he was carrying a gun) he has carried that strange feeling with him all his life. On Saturday approximately 200 people gathered at the Eldorado Outpost for a search in the Uwharrie National Forest. Walking through an open field a long line of searchers spread out as if they were doing a drive. A helicopter flew overhead, filming the scene. Camera crews on the ground filmed the searchers and whistles and bullhorns alerted the searchers when to stop. The searchers, found a deer carcass, animal hair on a fence and a Bigfoot print in the ground. Back at the Outpost people gathered to laugh about the hoopla surrounding the Bigfoot and enterprising young entrepreneurs sold shirts and Girl Scout cookies, taking advantage of the large crowds.